She was one of the most unforgettable people in my life. Soc Sinan was 22 years old when I met her. Within five years she had become trapped amid the horrors of Pol Pot's 'killing fields.' But Sinan was a survivor. She outwitted the Khmer Rouge. With a little help, she escaped Cambodia in the wake of the Vietnamese occupation. In America, she built a new life for herself, helping other Cambodian refugees. Sadly that life ended on December 9th, 2010 when she lost her final battle for survival; a battle against cancer. On December 9th, a friend, to whom I wish I had been a better one, ended her final struggle for survival. Soc Sinan, age 62, succumbed to liver cancer complicated by ‘hepatitis C’ contracted years ago in Southeast Asia. Her story is as remarkable as any in the wider war that was Cambodia. She was a survivor of Pol Pot’s killing fields (1975-1979). 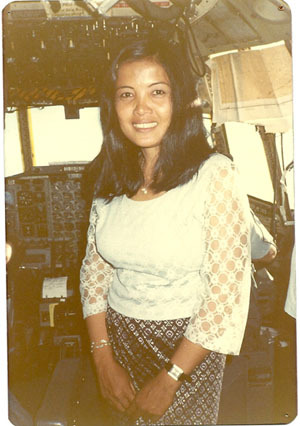 Soc Sinan was an employee of Sonatrac, a Cambodia-French agricultural firm, when I first met her in the summer of 1970. Before work one morning, Sinan walked from her office to the third floor café in the bank building near the Phnom Penh central post office where the daily military briefing was held. I ordered a café au lait, noticed her seated quietly in the back, clearly a newcomer to these proceedings. I took a seat nearby. I scribbled my notes, faithfully reproducing the official reports from the war front delivered by the Khmer Republic’s military spokesman, the aptly named, Colonel Am Rong and his English speaking attaché, Lieutenant Chhang Song. Sinan sat taking it all in: the clutter of shabby newsmen and women; the attempts to put the best face on Cambodia’s already shaky military situation; the new condition only five months after the overthrow of Prince Norodom Sihanouk; the extension of the Vietnam War to Cambodia. When the briefing ended, I introduced myself. Sinan was an exquisite, intelligent, engaging woman, with whom in the months and years ahead, I would develop the kind of never-to-be-forgotten relationship that only war and the passions of youth can provide. We met each other again in February 1975. She was engaged to be married to an American Army Colonel, a former defence attache’ in the Embassy. For reasons too complex to recall, she failed to join him and remained behind in Phnom Penh as the Khmer Rouge moved toward completion of their inevitable capture of the country. On April 5th, I made a promise: to get Sinan out of Cambodia come what may. I wrote in my diary. “She says she will leave Cambodia, but wants to stay through the Khmer New Year, Chaul Chnam Thme, which begins in ten days time.” Chaul Chnam Thme would be celebrated in Cambodia that year only by Pol Pot and his Khmer Rouge. In the early hours of the next day, word came that I must leave Phnom Penh. US Marine helicopters swooped into a school yard behind the American Embassy and launched a hasty evacuation which included the American television networks and their reporters. I raced to Sinan’s apartment on Boulevard Monivong at six in the morning. It was critical that she join the American helicopter evacuation. Her papers were in order; a visa for America, up-to-date. A ticket to Paris and Washington was confirmed. In desperation, I left a note and a business card with my address in Hong Kong. ‘Get out,’ I advised, advising the obvious, ‘anyway you can. Join me in Thailand or Hong Kong.’ I left to my everlasting regret, without her. Sinan never fully told the story of her cunning, bravery, endurance, and survival in the days, months, and years that followed. The American colonel in Washington assumed her dead. He waited and then married another woman. I too believed survival was not possible. Educated city people did not survive in Pol Pot’s Kampuchea. I dreamt she had worked herself to death in the communal paddy fields. In late September 1979, I received a letter at my old NBC office in Hong Kong, forwarded by an employee of an international relief agency in Singapore. Dated August 17th, it began “It is four years and four months since April 17th 1975.” I could not believe it. It was from Sinan. The two page, handwritten, almost dispassionate, letter, chronicled in a minimalist way her suffering under the Khmer Rouge. It said she was living in Kandal Province about thirty miles from Phnom Penh (now under Vietnamese control). She taught English there, helping survivors recover; helping provide kids who had had little under Pol Pot’s regime, some education. Sinan had survived. Now, as five years earlier, I became obsessed with my promise to get her out. I returned to Phnom Penh in November 1979. With much negotiation, a lot of help from friends; American, Vietnamese, Cambodian, and the then Foreign Minister, now Prime Minister, Hun Sen, my promise was kept. Hun Sen signed travel documents. I arranged passage on a returning relief flight to Singapore. The article did not explain how after we had been flown to Singapore on a flight chartered by Oxfam, Singapore officials threatened to send Sinan back to Cambodia and arrest me for abetting an illegal entry. Singapore in those days continued to recognize the ousted regime of Pol Pot. From Singapore, Sinan travelled to Washington where she made a new life for herself. We drifted apart in the late 1980’s. Much to my regret, I was not able to maintain her friendship. She had once again become very much a ‘remote friend.’ Yet she remained, all the same, the most unforgettable person in my life. Sinan’s survival story was like none other I had heard from among the many accounts of the ghastly Khmer Rouge era. The period with its tortures and its nearly two million deaths from starvation, disease, and execution is being revisited now at the United Nations sponsored War Crimes Trials in Phnom Penh. Sinan was the only survivor, I know, who managed to remain in Phnom Penh well beyond the Khmer Rouge forced evacuation carried out between April 17 and April 20, 1975. Within three days, at gunpoint the city was reduced in size from two million to about 25,000. Sinan was still there on April 27th… darting from house to house… eluding Khmer Rouge capture. When she was finally found, she was taken by truck to the District of Saang on the Bassac River in Kandal, an hour drive from the capital. She disguised her identity, her knowledge of French and English, her friendship with Americans, her engagement to a US Army colonel, and her birth as the daughter of a General under Prince Sihanouk. She managed to bury deep in a hole on her commune, a passport, a visa for America, her air ticket, and a crumpled business card and note from a young TV reporter from America. There was of course an element of luck. She was befriended by an older couple in the commune. She managed to get enough to eat. Yet like so many others, she worked under prison like conditions catching rats in the paddy fields, harvesting rice and working in the communal kitchens. Sinan kept her secrets amid great bravery. Every night, there were interrogations. People were dragged away from the commune, taken across the Bassac and put to death. Sinan could hear the sounds. In 2003, I took a boat out to the island in the river near Khum Troysla which had been the killing field. A shrine of skeletons and skulls stood in the middle of the island in memory of those who had perished. For the last 25 years, Sinan lived with her partner Walter in a modest but comfortable home in the Washington suburbs. She gave her new life to serving others. She met often with the local Khmer community – swollen by fellow survivors and other Khmer refugees who had been spared the horrors. She led a simple life. No frills. Where ever she went, Sinan brought compassion and help to those around her. She assisted older Khmer receive medical help at Georgetown University Medical Center. She served as a paralegal and a translator for refugee families. She helped a young man get a job. She saved a young girl from spousal abuse. She counselled them. Befriended them. Encouraged them. Sinan provided to others what she had lost in 1975 – the support of lost family and friends. As she endured her final struggle, 30 years after the Khmer Rouge, and four months after being diagnosed with cancer, Soc Sinan exemplified the best of Cambodia - Khmer courage, honor, kindness, and decency – representative of those who suffered one of history’s greatest periods of genocide. There is something about the draw of Cambodia. I pitched up here aged 22 in 1970 and have been coming back as regularly as possible ever since: this time on a very personal mission. I was trying to complete a full circle; a life’s journey for a dear friend. The following account is made possible with the help of my wonderful friends Chou Saorun, her engaging son Eric Ellul and the tireless San Arun..
On January 31st, 2011, 31 years after we left Cambodia together for Singapore and America, Soc Sinan came home. Her remains had been lovingly prepared by her long time partner Walter Teague in Adelphi Maryland. They were contained in a small, black, plastic box which I carefully wrapped in my old 1979 Krama (Cambodian scarf) and placed in my hand carry bag. Sinan thus travelled from New York to Hong Kong to Saigon, then by bus along Route one, across the Cambodian border and then on as she wished to her final destination - her mother’s village of Thlock Chrou in Kompong Cham on the Mekong River. It was here Walter reminded me that Sinan experienced some of the happiest days of her life. It is a two hour drive from Phnom Penh to Thlock Chrou Village. We set out just after 6:30 on a Monday morning. Highway 6A out of Phnom Penh follows the left bank of the Mekong River first north and then east into Kompong Cham Province. We were joined in our farewell by Chou Saorun, her son Eric Ellul, San Arun, and a colleague of Arun from the Ministry of Women's Affairs. Saorun’s love for Sinan goes back as long as mine. She knew Sinan during the worst of the war years from 1971 to 1975. They saw each other often. After Eric was born in 1972, Sinan visited their home often caring for the young boy. Sinan recalled a day in April 1975 when Khmer Rouge rockets rained down on the capital. Eric's eyes were wider than any other child she had ever seen, said Sinan, but he did not cry. It is dry season in Cambodia. About an hour out of Phnom Penh as we edge closer to the Mekong near the district capital of Kang Meas, the rutted road turns to dirt. Dust plumes envelop the car and the going is slow. At 8:35 we enter a school yard in the village of Thlock Chrou. In the yard, a welcoming group of about twenty people has assembled. knew Sinan as a little girl; knew her mother who was born in the village. Within the hour, the assembly grew larger as local villagers brought ornaments made from banana leaves, food, flowers, and other offerings including an array of common household items. These are called "pralong," the items needed, the Buddhist believes, for life in the next world. For a poor village it was an extraordinary effort. “When you brought the ashes back, Jim, I could feel Sinan’s soul returning to Cambodia. As you know ashes are like the "soul". The ceremony we organized for her was a way for her soul to be blessed, by making her present among us, with her friends and family in her native land. We Khmer people think "earth" is very important. The other purpose of the Buddhist rites were to allow her soul to live peacefully in a new world. We call this "phob thmey;, a new world with no regret, no fear, no pain... or any "blocked feelings". A large altar table takes shape before us. We place the small black plastic box containing Sinan's remains at the center. Soon the ‘achar’ arrives. A man in his early sixties, he will serve as the master of ceremonies in the rituals that follows. Two monks, tveu bon, have been asked to join, and face the assembled group in prominent positions. The ceremony, Saorun tells me, is called pram pi thgnay, rites held seven days after cremation. Khmer Buddhist believers also mark with prayer services mouyroy thgnay - after 100 days and Khuob mouy chnam - each year or every three years. Saorun, Arun, and I sit facing the 'altar' arrangement. Saorun sobs silently. A series of recitatives led by the achar summons Sinan's soul ...calling on her to return and be free. The young monks bless us all with a sprinkling of water. With the ceremony complete, a small group makes its way about a kilometer to the banks of the Mekong. It is a steep muddy climb down to the water's edge where a small boat awaits us. As I stumble down the embankment, I clutch the small black box now placed in a decorative tray surrounded by flower garlands. The little boat has room for only six. Saorun and others watch from the heights of the river bank. The achar, one monk, two boatman, Eric and I struggle aboard what appears to be a rather leaky vessel. When we ask why we could not rent a larger craft, so that all could say farewell, we are told that fisherman feel it is bad karma to carry the remains of the dead. A larger boat would be very expensive indeed. Once in the middle of the Mekong, I unwrap the box, unfasten the plastic bags inside. At first in handfuls, I throw the ashes into the river. It is a quiet moment. The monk and the achar are throwing flowers into the water as I scatter Sinan's remains. I wanted somehow to deliver a small benediction. Consumed with emotion, all I can muster is a muttered 'good bye' and a silent prayer. As in life - there are funny moments in death. Comedy amid tragedy. Wry moments that relieve pain. As I began to scatter the remains across the water, the wind came up suddenly. The tiny boat began to rock. The stiff breeze blew the ashes back into my face and on that of Eric. “As for you Jim - a great cloud of ash slapping you sharply across the face, left and right.” No doubt – a bit of revenge for my failure to treat Sinan as well as I should have. As we continued to scatter the ashes, the achar became impatient. He grabbed the plastic bag from my hand, scattering the last remains. To my horror, he then threw the bag into the river. And as I watched the bag float down the Mekong, all I could think was that 'zip lock bags' are not environmentally friendly! The boatmen expertly rowed us back to shore. Quite chastened by the experience, I staggered up the embankment to Soarun and Arun and the villagers. we bid farewell to Thlock Chrou and made our way back to Phnom Penh. Saorun, Eric, Arun and myself were physically and emotionally spent. We agreed that whether in life or in death - Sinan has had a lasting impact on us all.